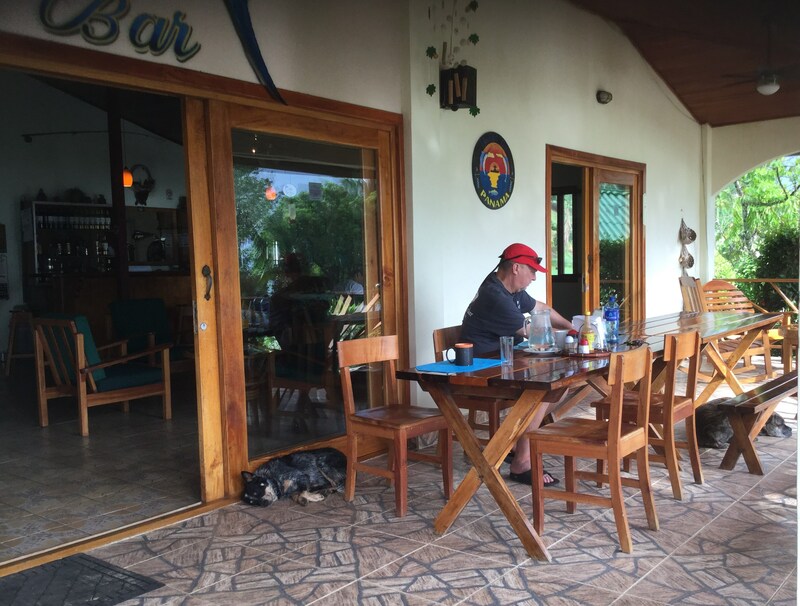 Last weekend we made our second visit to Hooked on Panama, a fishing lodge halfway down Punta Burica. 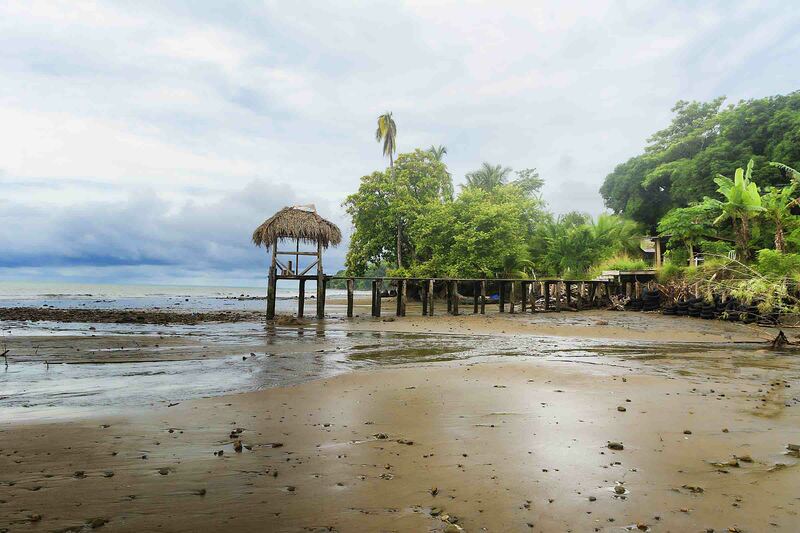 If you check the map, Punta Burica is the peninsula that sticks down in the Pacific in far western Panama, split down its length by the Panama-Costa Rica border. FUN FACT: our first encounter with Punta Burica was in 2004, when we sailed around it and entered Panama for the first time. We did an overnight passage from Golfito, Costa Rica to Panama’s Isla Parida, east of the point. One of the many things we love about this place is that it is completely dog-friendly; the owners themselves are dog owners. On this trip, we took our two little darlings and five more friends who also brought their pups, for a total of five dogs. 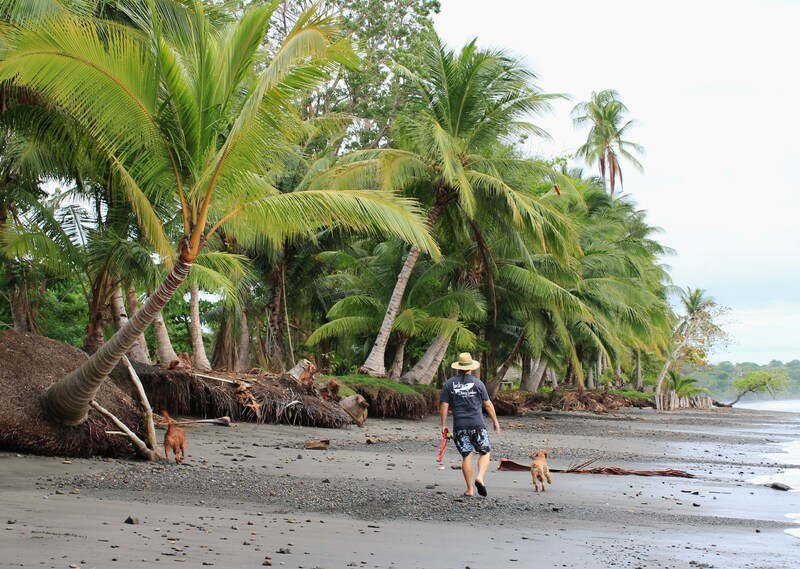 The only rule that Dan, one of the co-owners, gave us was that if any day guests showed up while we were there, we’d need to leash the kids (not everyone, especially Panamanians, think dogs are as charming as we do). Thanks to rainy weather on Saturday, we lucked out and basically had the place all to ourselves. Occupying four cabins, we were the only overnight guests. We, and the pups, had the run of the beach and beautiful landscaped grounds, and a chill time was had by all. 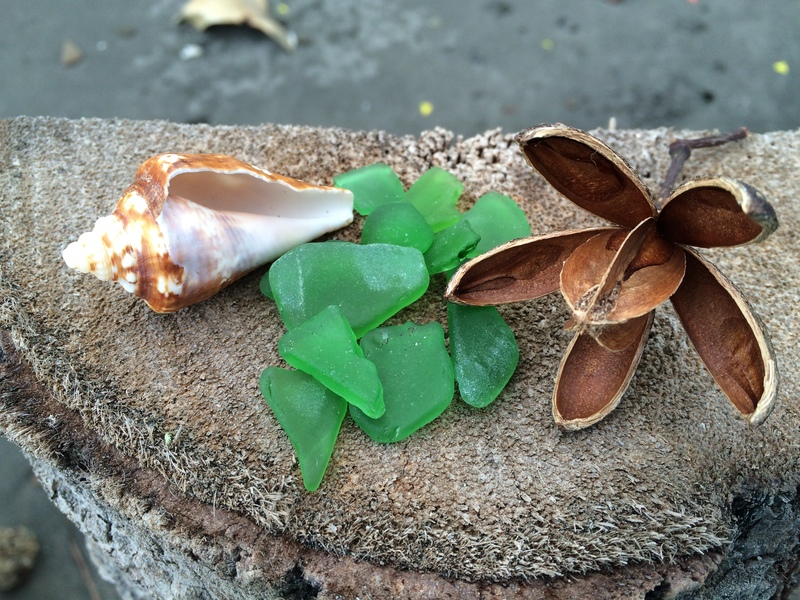 For our Panama friends as well as soon-to-be-expats, here’s the skinny on Hooked on Panama. Website: www.hookedonpanama.com. 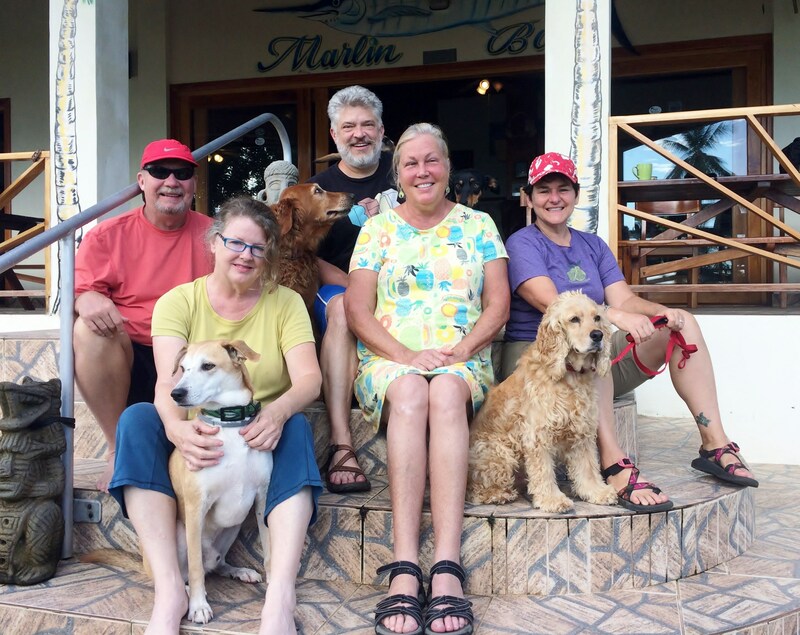 The place is owned and operated by three couples with a passion for fishing and a love of tropical locales, since several of them split their time between Hawaii and Panama. HOP is a beachfront property with cozy, cabin-style accommodations complete with A/C and Wi-Fi, a fantastic pool, and a full-service restaurant and bar. Ricardo, the bar manager, makes a mean bloody mary! Fishing, of course, is the theme of this place — and HOP attracts anglers from all over the world to have a go at the seasonal runs of tuna, marlin, dorado, and other sport/game fish that can be found just offshore. Although we’re not really into fishing, there are few things we love to eat more than fresh tuna. On our first visit, we arrived during tuna season and we had our fill of just-off-the-boat fish cooked to order. This time, the tuna was flash-frozen and just as good. The restaurant does a fine job with every meal, and we won’t soon forget the tuna sushi and ceviche appetizers and the fabulous fried red snapper that everyone shared on the last night. The tuna burger – cooked up from minced tuna and seasonings a la Hawaiian poke – was divine. Rates are much lower in the off-season (basically rainy season, which is now). 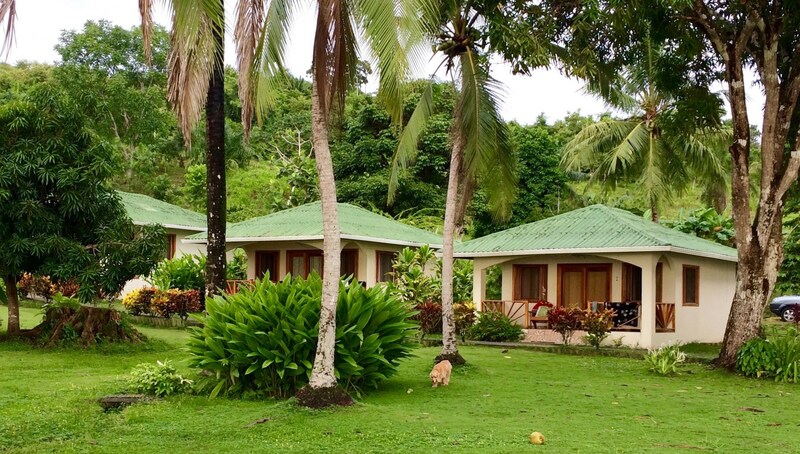 The owners gave us a very reasonable price for food and lodging, and they made it easy by letting us pay everything at the end with a single bill. The hospitality shown by the owners was outstanding. It almost seemed like we were guests in someone’s sprawling, lush estate rather than hotel clientele. Dan, watch out – I’m going to beat you at Pente next time! Beach shot. This one is actually from a year ago but it looks pretty much the same now. 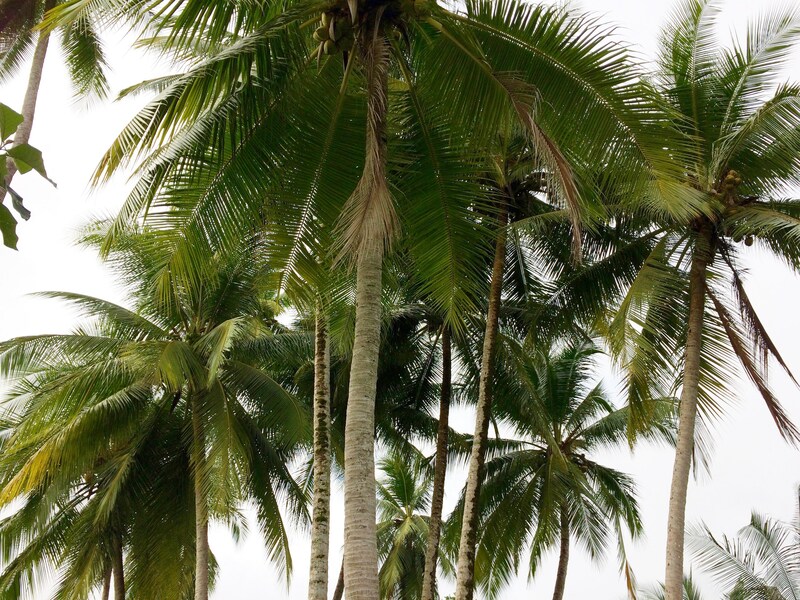 Coco palms. Don’t stand under them for too long! Down the beach. Great shot by our friend Larry Wilkinson. The cozy front patio, perfect for playing games on a rainy afternoon. Panoramic view of the pool, looking out towards the beach, from the front porch of our cabin. 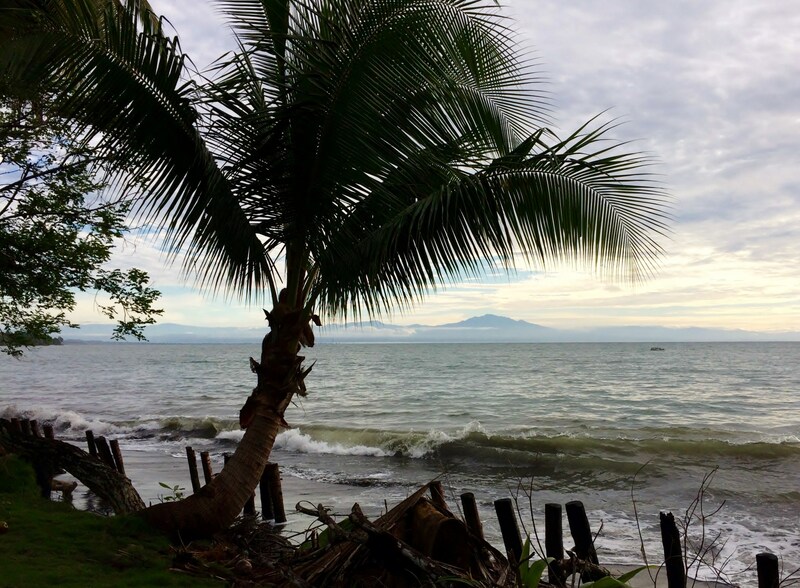 Beautiful Volcan Baru, looking across the gulf from the HOP beach. It’s a dog’s world – we just live in it! The group, minus two folks and one dog. Can you spot all the pooches in this photo? Hint: there are four. 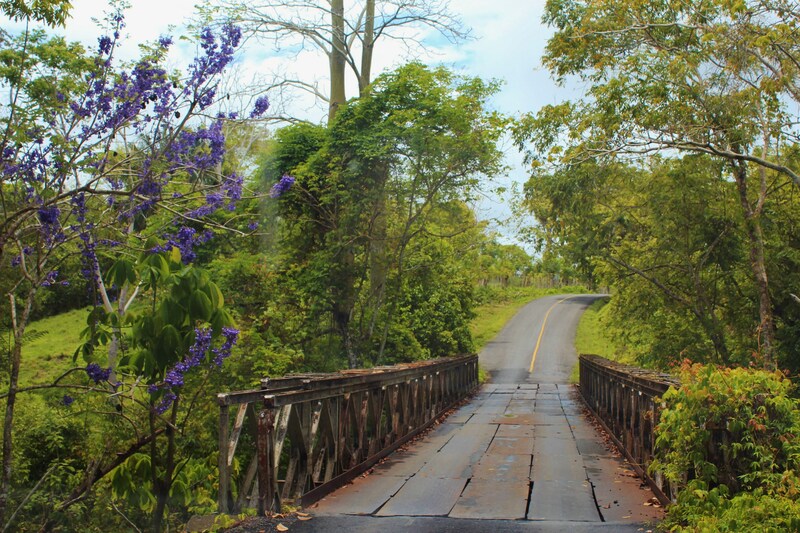 To get to HOP, you drive south through the old plantation town of Puerto Armuelles. 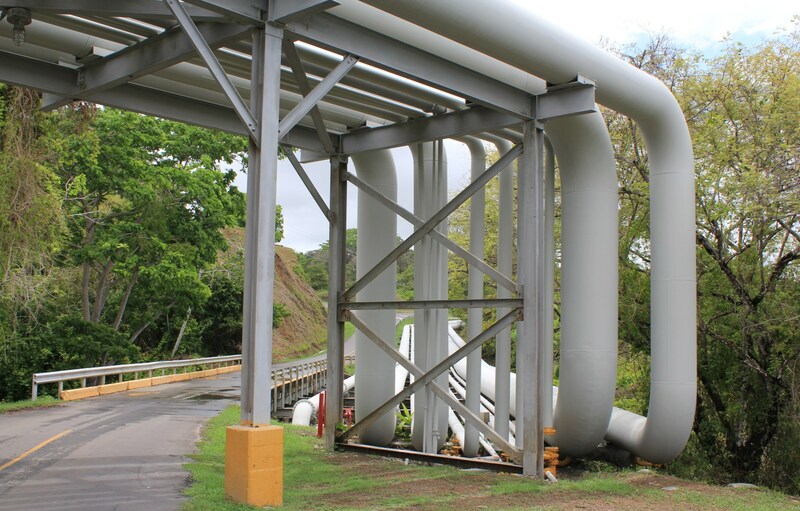 Next, you drive through the huge oil and gas shipping depot that serves both Panama and Costa Rica. Once you leave the depot, the road gets a lot more rustic. This bridge is a lot safer than it looks! 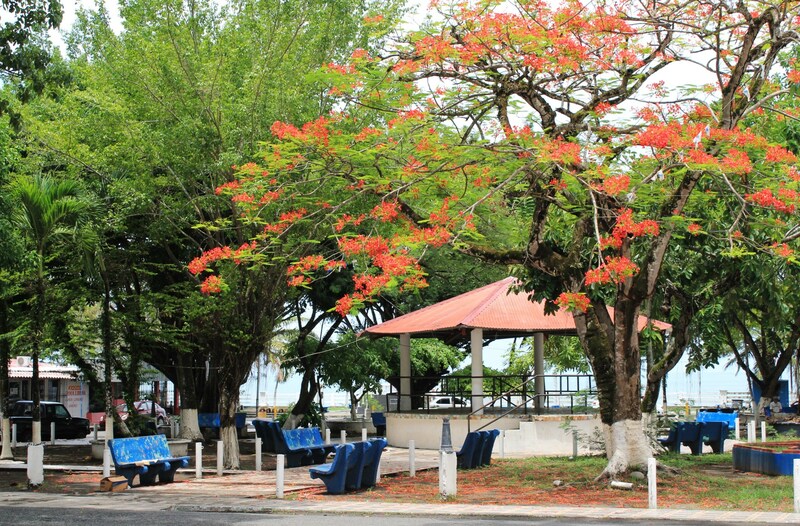 We traveled there on one of our first visits to Panama, and sampled one of those tuna sandwiches. Maravillosa! Our only complaint about the area is the typical gringo response: Hotter than Hades. Maybe not so much in the rain time. It is beautiful, though. I remember you mentioned that trip with Raquel – a long way to go for a tuna sandwich 🙂 It was super pleasant this time – we didn’t mind the rain because it kept things cooled off. Certainly looks like paradise for you and the dogs. It sounds (and looks) like heaven! Hi my name is Julie Reategui. I am Bud Brett’s daughter. Your blog is so much fun. This place looks like heaven. The picture with the doggies is so dang cute. I am going to Panama with my Dad next time. I would love to meet you. Thanks for sharing your beautiful life. 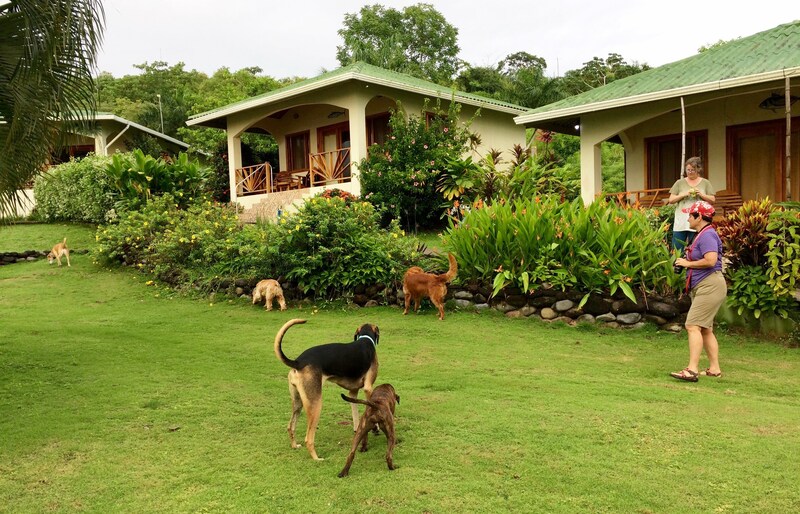 It’s not easy to find an accommodation with pet friendly policy and easy going with dogs, it’s great that you find one in Panama! We had a bit of difficulties when traveling on the road trip with our dog in the USA as not many places accept dogs. It’s a bit of culture shock for us – lol – when we were in Europe, we were used to know the restaurants and bars are mostly allowing dogs and the dogs’ extra cost in a hotel is not that expensive. Yes – it’s amazing how few places are OK with dogs, even in the U.S. Down here, there’s still a cultural issue with dogs since many people don’t regard them as members of the family – so they don’t really understand why anyone would want to travel with a dog or (heaven forbid) have it live in the house or sleep on the bed (yes, we’re THOSE people!). Things are changing here, though. It was the best! A super-chill place run by great people.